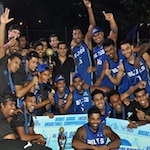 India celebrated victory at SAARC Division qualifiers of the Middle Asia Qualifying Round for the 26th Fiba Asia Championship. They stormed past Sri Lanka in New Delhi to book the ticket into the Fiba Asia Championship in Wuhan. Hareesh Koroth (185-G-84) knocked down 12 points to pace the winners. India left no chance for Sri Lanka right from the start. They outscored their opponents 25:2 in the opening frame. India did not loosen the grip in the second period. They boosted the margin to 40 points at the interval 51:11. India maintained the lead easily after the big break. They headed into fourth frame up by 52 points and killed off Sri Lanka in the final period. Vishesh Bhriguvanshi (192-G-91) nailed 11 points for the winners. Amjyot Singh (203-C-92), Pal Singh and Trideep Rai (190-F-83) contributed 10 points each for the hosts. Praneeth answered with 17 points for Sri Lanka.